This is a Professional grade 12 inch Locking Cable Release, made in Germany. This is brand new in the package. They do not get any better then this. You can tie it in a knot and it will still operate smoothly. I always get asked if this will fit someone's camera. I will say this, they are a standard size, all the same. If your camera has a threaded socket for a release this will fit and work fine. The operation is very smooth. Use this to reduce camera shake when shooting with a tripod. I use one when I do Macro work and also for the nice top of the mountain panoramic shots. There is no doubt that using a cable release produces a sharper image. For timed exposures it has a Zeiss Lock. You release the lock so when you push the plunger it says locked until you push the top of the locking disk and release it. The tip rotates to eliminate the possibility of it unscrewing itself while you are working. The absolute best cable release on the market today. This is sure to provide you with a lifetime of faithful service. This is one for the wildlife photographer. I have a friend that uses these all strung together, about 5 of them so it is more than 100ft long. He sets up the camera where the Moose and Deer come down to the river and waits inside with a can of compressed air. The move in and he shoots the air down the tube and he takes photographs of them from the comfort of his easy chair. That is the beauty of it all, use your imagination and do what you want to do with it. This item is brand new in the package. I really don't think you need the can of air even if you string them together...that is just one of those things you do for fun. The action is nice and easy even on the spool as you see it. One squeeze is all it takes. This will fit any camera that has a screw in threaded hole for a cable release. These holes are all the same size, vintage or modern camera, they are all the same. You can cut it shorter, get another one and double the length, it's very versatile. 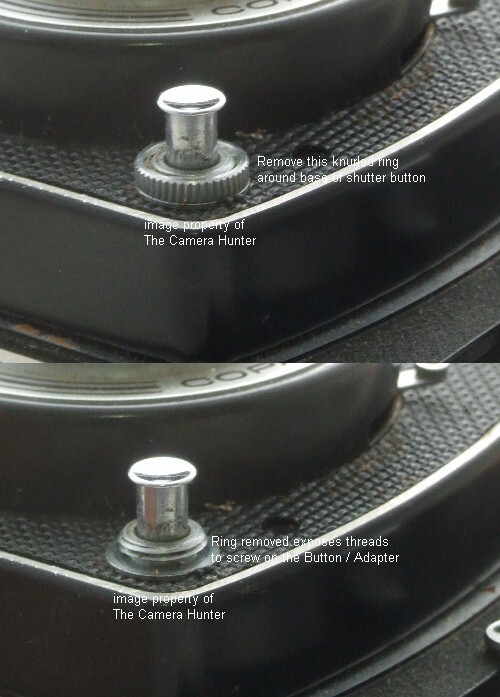 There is a nice swivel end so it will not unscrew itself and makes it easier to screw in the camera. Use this to reduce camera shake when shooting with a tripod. I use one when I do Macro work and also for the nice top of the mountain panoramic shots. There is no doubt that using a cable release produces a sharper image. For timed exposures just keep squeezing and it will stay where it is until you let go. This is sure to give many years of reliable service. This is a Professional grade 22 inch Locking Cable Release, made in Germany. This is brand new in the package. They do not get any better then this. You can tie it in a knot and it will still operate smoothly. This is a very nice plastic covered 40 inch Locking Cable Release, made in Japan. I sell these in a variety of lengths, from 12 inches all the way up to this 40 inch one. My personal preference is to have the long one which allows for greater mobility. One example of why I like the longer one is doing Macro work low to the ground with my 55mm Macro lens. After being crouched down getting the camera all set on a flower only to have the wind blowing and needing to wait for it to die down to take the shot. With a short one I have to stay down there with the camera until the flower stops shaking in the wind. With this long one I can stand and wait, move around a bit and not miss or rush the shot. I always get asked if this will fit someone's camera. I will say this, they are a standard size, all the same. If your camera has a threaded socket for a cable release this will fit and work fine. This is a very nice one, certainly one of the best one's made today. I really like the simple twist and lock operation and the swivel tip. The operation silky smooth. The swivel tip makes for easy on and off and also prevents it from unscrewing itself during operation. Use this to reduce camera shake when shooting with a tripod. I use one when I do Macro work and for those once in a lifetime, top of the mountain panoramic shots. There is no doubt that using a cable release produces a sharper image. For timed exposures just push the plunger and tighten the knurled locking screw. When you're done loosen the locking screw and the plunger releases. This is sure to provide you with a lifetime of faithful service. Here is a brand new metal adapter made by Hama in GERMANY. This allows you to attach a standard screw-in cable release on Leica and Canon M39 screwmount rangefinder cameras as well as the Nikon rangefinder, Nikon F and early Nikkormat cameras. Here is a brand new metal adapter made by Hama in GERMANY. 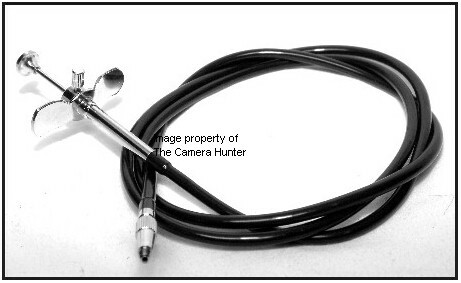 This allows you to attach a standard screw-in cable release with some older Canon, Leica, Nikon, Yashica TLR cameras. If you need a cable release to go with it I have them listed as well. 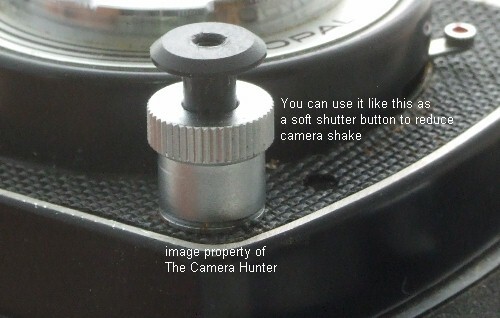 Here is a brand new ultra soft shutter release button for your camera. This little item is top quality, machined out of solid brass and chrome plated, made in JAPAN. Some people are all thumbs. 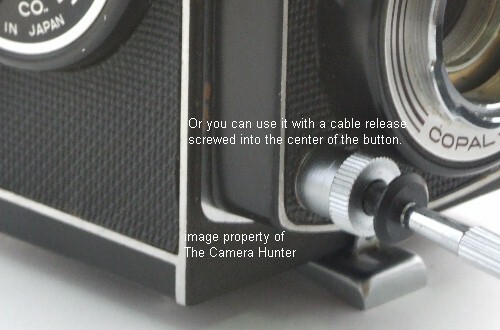 Pushing the shutter button on their camera is awkward without this button. Consequently the camera gets shaken around resulting in blurred photographs. This little button is a must have for all of your cameras. It will screw right in to nearly every camera ever made. As long as your shutter button has a threaded hole in the center this will fit.